Yes, I’m about to prepare a very simple recipe called When Cream Will Whip Well that is in the Creams section of The New Galt Cook Book (1898). It doesn’t have a contributor so that makes it easy since I don’t have to do any research. My excuse is simple. I’m tired after a busy day at work and home. But I also think that this recipe explains some aspects of dairying that could be useful or at the very least interesting. The recipe describes both the purchase of cream and the homemaker who has her own cow. Best of all it describes the types of cream available including how long the milk must sit to obtain the different types of cream. When I was a child my mother’s sister moved with her family from a small house in a nearby city to a huge farmhouse on a farm several hours further north. It was exciting to stay with my cousins especially when they would hitch up their pony to an old carriage and we’d race around the fields wondering if we were going to bounce right out of the seat and onto the ground. I also enjoyed watching my aunt hand milk the Jersey cow they kept in the old barn. I felt the milk was far too creamy to drink but it was amazing to watch the rich cream skimmed from the milk become butter in an old glass butter churn. The best thing of all was eating the delicious homemade ice cream made from the Jersey cow’s milk. I have a carton of whipping cream in the fridge so it is cold but is it really the right type to whip according to this recipe? Well, it does pour so it isn’t too thick. The carton says it is 35 % BF/MF (butter fat/milk fat). Even today we can buy several different types of cream. There’s table cream at 18% BF and half and half 10 %BF (or as one of my friends calls it “moitie moitie” since that’s what the carton says in French). Here’s a link to more about Canadian cream that includes equivalent terms used in the United States, Britain, and Australia. I’m not going to dilute my cream by half as I just don’t think it would whip but I thought I’d try adding 1/4 cup of milk to 1 cup of cream to see what would happen. I have both a whisk and a “patent egg beater”. One of the big names in rotary egg beaters was Dover. Sometimes people used this brand name as the generic name for egg beaters much as we might talk about Cuisinart or Kleenex. Today there are only a couple of variations of these hand egg beaters but there used to be many different types including some that fit into an attached bowl. For more about the history of egg beaters check out this link. 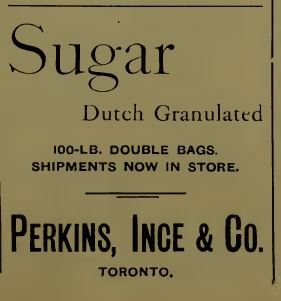 One of the surprise discoveries while researching this blog is the variety of products available to consumers in 1898. The Canadian Grocer magazine has advertisements for all sorts of brand name foods, some are still available. 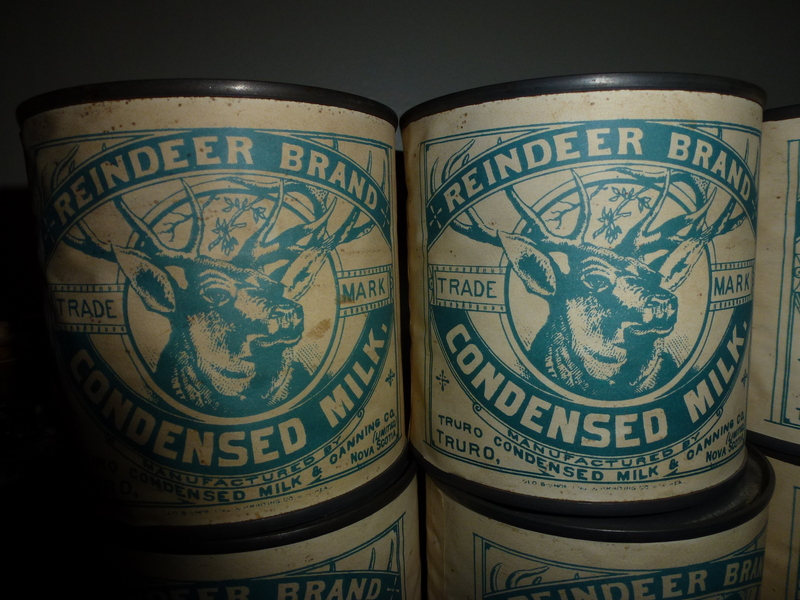 Do you have a can of condensed milk or evaporated milk in your cupboard? People in 1898 could have these canned goods too. Although my cream and milk combination started to thicken a bit it never became stiff or even had soft peaks. Sometimes I don’t beat my cream enough since I’m concerned about over-whipping. However, with the addition of milk I wasn’t worried about over beating and turning my cream into butter. I might try adding just a touch of milk next time I whip cream. A cream so thick that it will hardly pour should be diluted with the same volume of milk; this will give good whipping cream. Such cream as is sold at the creamery as “heavy” cream will admit of this amount of milk. The thin cream, as a rule, has not body enough for whipping. If one have her own cream, particularly if from a Jersey cow, it will be apt to be too solid and must be strained after being thinned. The cream should be very cold. Put it in a large bowl, which place in a pan and surround with ice water. It can be whipped with a whisk, or with any of the patent egg-beaters. Single cream is cream that has stood on the milk twelve hours. It is best for tea and coffee. Double cream stands on the milk twenty-four hours, and cream for butter frequently stands forty-eight hours. Cream that is to be whipped should not be butter cream, lest in whipping it change to butter. It’s been a long day and so I’m going to try a recipe that sounds like a quick treat. It’s Cream Meringues, a recipe Mrs. W. H. Lutz contributed for the 1898 New Galt Cook Book. Although I like meringues I don’t want to overindulge so I’m going to cut the recipe in half. I separated 2 eggs and started whisking the egg whites. Based on the recipe I wasn’t sure when to add the next ingredient. Should it be at the beginning? I split the difference and added the 8 ounces of icing sugar when the whites were foamy but not in peaks. I assumed that Mrs. Lutz meant icing sugar when she wrote powdered sugar. I hope I’m correct. I continued whisking but seemed to have created a drizzly style of icing rather than the base for meringues. I preheated the oven to 400 F and then tried to spoon the mixture onto a cookie sheet. There was no “heaping” with this stuff. It spread into a flat blob. I decided to stop with just a couple and try baking the meringues. I popped them in the oven and checked after ten minutes. I expected a mess but they had puffed up a bit and were golden. I removed the pan from the oven and started whipping some cream. I really should have checked on what charlotte russe style cream involved. I was supposed to have dissolved gelatine and then mixed it in. Since I already had a strange mess of meringue I decided to just use plain cream. I tried scooping out the middle but these were such flat meringues there wasn’t much of a middle. I let it cool a bit and then piled some whipped cream in the middle. It was time to taste this concoction. Mrs. W. H. Lutz is probably Mary Jane Stuart. Her Canadian born parents Elisha and Zillah were living in Brant county when she was born in 1851. Mary Jane was the only girl among five boys. She married William H. Lutz in 1876. Their only child Ethel Lorne Lutz was born a few years later in 1879 but unfortunately this little family experienced the ultimate tragedy. In 1886 seven-year old Ethel caught diphtheria and died a week later. It must have been extra heartbreaking since her father was a druggist. Two years later William was part of the first board of trustees for the Galt Hospital Trust and continued this commitment for 40 years. The couple continued to be involved in the Galt community for many years afterwards. Mary Jane died in 1929 and her obituary transcribed here mentioned her involvement with good works. I think made correctly this would result in something resembling Pavlova. Mine was more like Eton mess. I’ve successfully made Pavlova, a meringue based dessert, many times. Based on that experience I think I should have whipped the whites completely before adding the sugar and maybe used fine granulated sugar rather than icing sugar. Four eggs (whites), one pound powdered sugar, lemon or vanilla flavoring. Whip the whites of the eggs and sugar stiff, and add flavoring; heap in the shape of half an egg upon letter paper, lining the bottom of the pan; have them one-half inch apart; when a light yellow brown, take out and cool quickly; slip a knife under each; scoop out the soft inside and fill with cream shipped as for charlotte russe. Oven should be quite hot. I’d planned to make something long simmering today since it is my day off but there turned out to be a heat alert and it was predicted to be the hottest day of the year. Not a good time to have things heating up the kitchen for hours. Instead I’m making a chilled and no cook recipe called Swan’s Down Cream that appears in the Creams section of the 1898 New Galt Cook Book. The recipe’s contributor Mrs. Thompson comes from Chicago another city familiar with hot humid summers. I didn’t want to have too much of this dessert around so I’m making just one third of the recipe. The first thing I did was separate 1 egg, pull out my manual egg beater and beat the white. I set that bowl aside and started whipping 2/3 cup of whipping cream. Once it was whipped I started adding the other ingredients. I added 1/3 cup of icing sugar to the whipped cream and 1/3 teaspoon of bitter almond flavouring. You can find a flavouring called bitter almond in tiny bottles at some specialty baking and bulk food stores. This is one of those ingredients that is far less common these days due to fears it can be poisonous if too much is consumed. If you can’t find it, use pure almond extract rather than artificial to get the intense almond flavour intended in this recipe. Check here for more about almond flavourings and I learned a lot about bitter almond extract from this Canadian site. The egg whites in this recipe also reflect changes in how we use ordinary ingredients. The egg white in this recipe is not cooked so you can use pasteurized egg whites to avoid the possibility of salmonella. After I whipped my egg white I put it in the fridge until everything else was ready and then I added it to the bowl. I whipped it all together, spooned some into a bowl along with some sponge cake and sat down to enjoy Swan’s Down Cream. Mrs. Thompson of Chicago is not going to be easy to find. The 1900 US census shows many many Thompsons living in Chicago. I did find a 72 year old widow named Ellen Thompson who was living with her daughter Georgiana and son-in-law James Barton. They’d all been born in Canada and Ellen had arrived in the US in 1888 so she might be Mrs. Thompson. Her daughter had moved there in 1881. There were quite a number of Thompsons from Canada in Chicago in 1900 but they had Irish roots and had come from Nova Scotia. Among the people I’ve already researched the Essons, Goldies and Groffs have Chicago conections so perhaps if I did deeper into their families I’ll find the Thompsons. The Moffats have a Thompson connection but I haven’t found the Chicago link. The Caprons moved to Chicago. Swan’s Down Cream is a nice light dessert on a hot day, especially if the bowls and finished cream are nice and cold. It is sweet and the almond flavour is nice. I’d like to serve it with some berries or other fruit as well as the cake otherwise it is a bit bland. One pint whipped cream, whites of three eggs beaten to a stiff froth, one cupful of powdered sugar, one teaspoonful essence bitter almonds. Just before you are ready to send the dish to table beat whipped cream, frothed whites, sugar and flavoring together in a bowl set deep in cracked ice. Heap in a glass dish and leave in the ice until it is to be eaten. Send sponge cake around with it. I’m going to make another summer time recipe called Spanish Cream. There’s an entire section in The New Galt Cook Book (1898) called Creams. The recipe was contributed by Miss Bell of Toronto. I decided to make half the recipe since I’m not sure I’ll like this dessert. I put 1 cup of milk in a bowl and sprinkled 1 1/2 packets of Knox gelatine on top and stirred it into the milk. 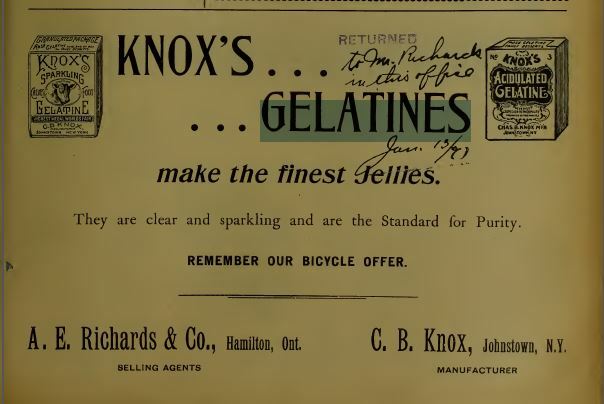 Based on some other recipes I think that the box of gelatine was about the same size in 1898 as today so I believe the measures are comparable. Once the gelatine had soaked for 1 hour I put it in a pot with another 1 cup of milk. I also separated 2 eggs putting the whites aside and mixing the yolks with 1/4 cup of sugar. I added the yolks to the milk mixture and let it boil until it was thick. I removed the pan from the heat and set it to cool. I whipped the egg whites and then folded it into the mixture. I let it cool more and added some vanilla. It was time to sample. Miss Bell of Toronto could be Elizabeth A. Bell or her sister Jeanette “Jennie” Bell. Their mother Susan Kinsmen was another contributor. I talked about them on Day 79. I decided the easiest was to include a link since I wrote quite a bit about this family. Spanish Cream is like many of the other milk/cream based and gelatine desserts in this cook book. It is okay but nothing special. I have no idea why it is called Spanish Cream. What makes it different from Bavarian Cream? One quart milk, four eggs, three-quarters box gelatine. Pour half the milk on the gelatine and let it stand one hour, add the rest of the milk and boil all together. Separate the eggs and sweeten to taste, mix the sugar with the yelks, when the milk and gelatine have boiled, add the yelks. When the cream is thick and smooth flavor with vanilla, take off the fire, stirring all the time, as it gets cold add the whites. Now that we are fully in summer and the weather is warm I’m going to make Vanilla Ice Cream using a recipe in The New Galt Cook Book (1898). I’d planned to make this ice cream in my ice cream freezer but I couldn’t find it. I haven’t used it in over a year and can’t remember where I decided to store it. So I’m going to use another method which involves some modern plastic bags as well as the traditional salt and ice. I decided to make half the recipe to make it easier and quicker to freeze. I separated 1 medium egg and whipped the egg white and then added just a little under a 1/2 cup of super fine sugar which is sometimes called fruit sugar. I think this is close to the berry sugar called for in the recipe. I folded the sugar into the egg white and then added 1/2 tablespoon vanilla. Finally I added it to 1/2 quart (2 cups) of cream and stirred well. It was time to freeze. I put part of the mixture into a ziplock plastic bag and then put that bag in one with salt and ice. Iput the rest of the mixture in a bag in the freezer to see how it would turn out too. I tossed the bag in a bag back and forth in my hands for about 15 minutes and kept doing it until the liquid started to set. I continued until I had a solid mass ready to sample. I suspected this would be good ice cream when I sampled it in liquid form since it tasted like vanilla ice cream. The frozen version was even better. This is a very simple and delicious ice cream. The only concern is that it contains raw egg white. I’m not sure the purpose of this ingredient. I suspect it helps to prevent the sugar from crystallizing and perhaps acts as a thickener the way gelatin is added to modern ice cream. I suppose it could be eliminated if you have concerns. Otherwise give this recipe a try! One quart cream, two egg whites, 1 scant cup of berry sugar and 1 tablespoon of vanilla. Whip the egg white to a froth and then add the sugar. Mix into the cream and add the vanilla before freezing. Summer was the time for cold and creamy desserts at least based on the large number of recipes using cream and ice in the 1898 New Galt Cook Book. Tonight I’m going to try making a Bavarian Cream using a recipe contributed by Mrs. W. H. Lutz. Actually I’m going to make half the recipe. The first step was to weigh my gelatine. I discovered one envelope of Knox granulated gelatine is .25 ounces. Since I’m cutting the recipe in half I just need one envelope to get a 1/4 ounce. I poured the gelatine into a small bowl and added enough cold water to cover it. I set it aside for an hour. Next I started heating 1 cup of whipping cream. While it heated I beat two egg yolks and 1/2 cup of white granulated sugar. Once the cream was hot I added the softened gelatine and stirred well. The gelatine quickly melted into the cream and it was time to slowly mix the egg yolk and sugar combination with the cream and gelatine. Once these were well mixed I returned the saucepan to the heat to get thicker. I kept stirring the entire time to prevent lumps and burning. It didn’t take long to get thicker so I removed it from the heat and started whipping the other 1 cup of cream with my rotary hand beater. I was worried it would take a long time to whip since the kitchen was quite warm but it was stiff in about 5 minutes of beating. Now I needed to add 1/2 teaspoon of almond flavouring to the egg mixture before I slowly stirred in spoonfuls of the whipped cream. I thought whipping it first might be pointless as I watched it melt into the hot liquid. Eventually it was ready to pour into a wet mould. I popped it into the freezer rather than go out and buy ice. Although I used 1898 techniques for this recipe there are certain things that just make it easier in 2014 to try this recipe. I was able to buy a carton of cream at the store rather than skim it from milk or buy a bottle of cream from the milk man. I cooked the cream on an electric stove. All I need to do is pay my hydro bill and I have a hot stove while Mrs. Lutz needed to carry fuel (or get a servant to do it) and add it to the stove. She also needed to purchase ice and store it to be able to put her Bavarian Cream “on ice”. I left it in the freezer for an hour and then scooped out some to sample. I didn’t try to unmould the bavarian cream. Mary Jane Stuart was born in Brant county in 1851 to Elisha and Zillah and grew up in Burford. She met and married William H. Lutz in 1876 and they had one daughter Ethel. They lived in Galt where William was a druggist. Unfortunately in 1886 Ethel died of diphtheria when she was seven years old. Diphtheria killed other children connected to this cook book so I thought I’d talk a bit about this disease. According to Immunize Canada it was one the main causes of death for children between 1 and 5. In addition to feeling unwell, and fever, a thin membrane can grow across the back of the throat and affect breathing. Today it is rare in Canada due to childhood immunization (it’s the D in the DPT vaccine). This version of Bavarian Cream isn’t a very exciting dessert. I remember making it for a 4H club when I was a kid and really liking it but I think there was fruit involved. In the current version the almond flavouring is the only distinctive thing about it. It is basically sweet cold thick cream. It w0uld be nice served with berries or a fruit sauce on top. I didn’t try to unmould the bavarian cream. One quart sweet cream, four eggs — yelks, one-half ounce gelatine, one cupful sugar, vanilla or almond extract, cold water. Soak the gelatine in enough cold water to cover it one hour, then stir it into one pint cream made boiling hot, beat yelks smoothly with the sugar, then add the boiling mixture, beaten in a little at a time, beat until it begins to thicken, but do not actually boil, remove from fire, flavor with one teaspoonful of the essence, and while hot stir in the other pint of cream whipped to a stiff froth, beat this, whip a spoonful at a time into the custard until it is like sponge cake batter. Dip a mould in cold water, pour in mixture and set on ice to form. Do you ever just want something decadent but don’t want to spend hours making it? Sometimes it seems the most delicious things require time and/or money but I think I’ve found something that seems lovely and sweet but won’t require a lot of time. In fact it doesn’t look like it needs cooking, a bonus on a hot evening. I’m going to make Caledonian Cream, a recipe contributed by Mrs. A. T. Reed of St. George for the 1898 New Galt Cook Book. I cracked two medium eggs separating the yolks and whites. The yolks aren’t needed for this recipe and if I’d planned ahead I probably could find a use for them. I beat the whites and then tried to decide at what point to add the 2 tablespoons of white sugar. I’ve made meringue and often it is suggested to add the sugar when the whites are airy but are not yet stiff. Other times they say to beat the whites stiff and then fold in the sugar. I decided to try the first method partly because the whites just didn’t seem to want to get firm. I was using a hand rotary beater — what could be called a Dover mixer in 1898 — and my hand was getting tired. After I added the sugar the whites did get a little thicker but not to the point that they would stand on their own as the recipe required. I suspect there was still a bit of water on my beater or bowl. Although the whites weren’t stiff I decided to continue and added 2 tablespoons of red currant jelly and 2 tablespoons of black currant jam. I know it was supposed to be raspberry jam but I didn’t have any and I wasn’t sure what sort of currant jelly to use so I decided to use both black and red. I mixed the jelly & jam with the sweet whites and prepared to taste. Mrs. A. T. Reed of St. George is a mystery! I expected to find her easily with two initials in her husband’s name but so far no luck. I was surprised that this concoction tasted so good. It is light and fluffy and sweet but not cloying. It was also a bit creamy even though it doesn’t have any dairy in it, something I appreciate since I shouldn’t have milk. If you have concerns about consuming raw egg whites you can buy a carton of pasteurized egg whites. Even that won’t ease everyone’s fears but I can’t imagine heating this mixture. I suppose you could bake it but you’d end up with meringues not Caledonian Cream. I thought the title of this dessert sounded familiar and a quick internet search revealed that Caledonian Cream is a traditional Scottish dessert. No wonder it appears in a cook book created in Galt Ontario, an area settled by many people from Scotland. However, the recipes I found were different since they used cream, cream cheese and marmalade. Here‘s an example. Somewhere I have a cookbook of Scottish recipes and I think it also has a recipe for Caledonian Cream. I’m also making it at the wrong time of year since apparently it is a New Year’s tradition. Unfortunately, since I hadn’t whipped the whites enough, the mixture started to separate and wasn’t as appealing as in the first hour. I’m going to keep this recipe in mind since it is easy to reduce or multiply since currently the proportions are 2 whites x 2 T sugar x 2 T jam x 2 T jelly. Two whites of eggs, two tablespoonfuls loaf sugar, two tablespoonfuls raspberry jam, two tablespoonfuls of currant jelly; beat until they will stand alone.